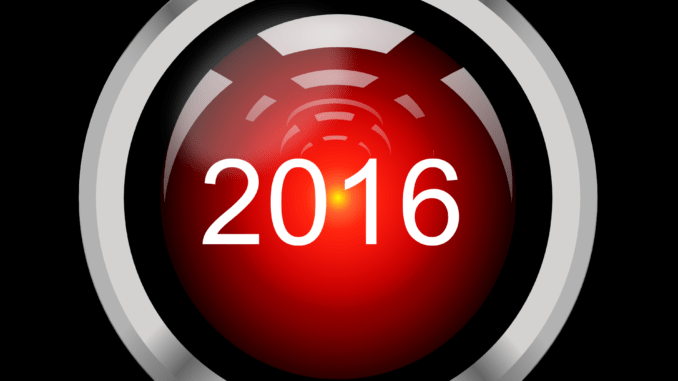 2016 will be remembered as the year when legal AI and advanced automation went from being a subject for conference discussions about ‘the future’ and became something very real in the eyes of the market, and perhaps most importantly something that law firms were actually using for client work. AI and advanced automation, at least as theories, have been around since the 1950s and such pioneers as Marvin Minsky and Norbert Wiener were some of the leading lights in these fields back then. But, the fact that AI has a long and historical backstory doesn’t diminish the fact that at the start of this year the idea of large numbers of law firms actually making use of legal AI systems, as opposed to just talking about the subject, was not really ‘a thing’ yet. But, wow, what a difference a year makes. Looking back on 2016, as the year draws to a close, it feels like we have entered a new era. So, what has happened? First it needs to be remembered that although it might sometimes feel like legal AI sprung into existence fully formed in 2016, like most new technologies some of the companies now hitting the headlines had been working on AI technology for several years. For example, UK-based RAVN Systems, which is one of the best-known legal AI companies, launched in 2010 and has done years of pioneering work developing their own cognitive engine using machine learning and natural language processing (NLP). While Toronto-based Kira Systems, probably the other most famous AI company in the legal document analysis space, has also been around since 2010 and also spent years iterating and improving the system that is on offer today. And, if we want to get really accurate about the significance of 2016, we actually have to roll back to the year before where the first catalytic events took place, at least in terms of the market taking note, which in turn helped to set up this year’s torrent of activity. In September 2015 UK law firm BLP announced a collaboration with RAVN to work on the extraction of unstructured data from leases. On the other side of the Atlantic another legal AI company was stealing the headlines. ROSS Intelligence, an AI company focused on legal research applications, (at least for the moment), had already in 2015 begun to capture people’s imaginations about a new dawn for the legal industry. A wave of news stories across the planet was closely linked to US law firm BakerHostetler signing up ROSS for use in its bankruptcy practice, which seemed to many as a landmark moment in that a major law firm was now putting to work an AI system, not just toying with the idea. Clearly something had changed. But, what would happen next? The answer came a year later. What then happened this year, 2016, was unsettling to some even if it had been flagged up for more than a decade. For a long time, some might say since the late 1990s, a small group of pioneers had helped to develop the thinking around the use of automation and computing in the law, such as Richard Susskind, and had been preparing people for the arrival of technology such as AI. Talking about it was very comfortable. But, all that seemed suddenly…how can one put it? It all seemed academic now. Legal AI was here now and it was real. Moreover, not only were law firms adopting it, the clients were paying for its services. The new era of legal AI had well and truly begun. What started as a trickle of news about legal AI soon became a flood, something that Artificial Lawyer can testify to. Initially it was not certain there would be enough news in such a niche field to sustain a site dedicated to legal AI and cutting edge legal tech. When Artificial Lawyer launched in the middle of June this year, (yep, just six months ago), it was not even certain there would be sufficient readers to make it worthwhile. Within a couple of months the site was receiving multiple thousands of unique visitors and keeping up with events was becoming a full time job. This reflected in turn a wider interest in legal AI across the market that truly blossomed in 2016. For example, type in the words ‘artificial lawyer’ into Google and you get 7.84 million results. And that raises another question: could a site like this have existed before? One can seriously doubt whether a website called Artificial Lawyer in, for example 2006, would have received the same level of interest, or had that much to write about. In 2006, the site would have been almost entirely theoretical. It would have been sparsely populated with comments from a few talking heads, talking again and again about the same theoretical issues. In short, it would not have been of much interest. News is about actual events, not just theory. And there was no legal AI news back then. My view is that neither too much has changed (in fact, it’s only just started to change), nor is this hype. It is very real and having an impact, but it is still small for now. Hype is about the latest version of the flying car that will never go into production, or marketing spiel about smart watches changing the world, even though few people have really ever used them for more than fitness tracking. Moreover, the many new legal tech companies that are now emerging, both those operating inside the AI spectrum and several in other areas, are transforming the way we think about the production of legal work. They are changing client relationships and the internal dynamics of law firms. And though I don’t see the end of lawyers, we will probably see a big reduction in the need for paralegals in the years to come. This is happening because this wave of legal AI and automation companies really do provide something that works and really do make a difference to lawyers and clients. Rather than give you a blow by blow account of every story that seems interesting (which to me is all of them…), here are some key themes that have emerged from 2016 that encapsulate the changes taking place. Client Wins – what differentiates 2016 from the previous years is that there have been several legal AI companies gaining not just one or two client wins, but a raft of long-term licence agreements for their latest technology. While ROSS has gone from strength to strength in the field of AI legal research, adding Womble Carlyle and Bryan Cave as clients among others, it has been document analysis where the greatest volume of deals has taken place. Kira has, at least based on public data, been the most successful legal AI company in 2016 in the analysis sector, collecting deals with a raft of firms, including: McCann FitzGerald in Ireland, Fenwick in the US, Osler in Canada and Freshfields, Clifford Chance and Addleshaw Goddard in the UK, and DLA Piper as well. It has also struck a deal with Deloitte. RAVN also did well, signing up US firm Reed Smith and worked with global firm Dentons to develop a Brexit analysis tool, it’s also being used by UK telecoms giant, BT, among other developments and also building upon its deal with BLP. Several other law firms are also now piloting RAVN’s cognitive engine. Other AI companies such as LEVERTON, which has also signed up Clifford Chance, won significant clients, such a global property adviser JLL. The German company, which is largely focused on real estate matters, also formed a partnership with data giant SAP, to help in the development of its ‘data core’ concept. The newly launched Luminance has secured Slaughter and May and is also piloting with several firms around the world. Beagle won VW as a client, did a joint venture deal with Australian law firm, Corrs, to market the AI document analysis system in the Asia Pacific and won other significant clients in the financial sector. Beagle also received investment from Dentons’ Nextlaw Labs (see more below). US-based Legal Robot is working with GE. Diligen is working with a global law firm, but cannot name it yet. While, Seal, another document/contract analysis system has now got a client base of corporates that dwarfs most other AI companies. Its clients include: Microsoft, Bosch, Dropbox, Experian, PayPal, Vodafone, DocuSign and even HP, though these were not all won this year. And the list goes on of legal AI companies and their growing client lists. So, the next time a jaded IT director or tech consultant who doesn’t feel that excited about the new wave of legal technology that is superceding their experience says to you: ‘Yeah, well, it’s all hype. No one is really using legal AI…’ then you’ll have some ammunition to respond with. New Legal AI Company Launches – as noted, although it can feel like all the legal AI companies were spontaneously created between mid-2015 to mid-2016, many have been going for some years. That said, there are some that are quite new and have only reached public attention in 2016, these include: Canada’s Diligen, the UK’s Cognitiv+ and Luminance. While America’s Legal Robot only launched last year and the UK’s Thought River also got going in 2015. It’s probably fair to say that the majority of legal AI companies are at present based in the US, Canada or the UK, with a couple of others in Germany and Israel. In the latter case, LawGeex has been a true pioneer in terms of contract analysis and assistance. That said, these are early days. It’s a big legal market out there and these happy few are just at the start of something very big. France, in particular, is producing some great new legal tech companies with big ambitions, it will no doubt soon start to generate several legal tech companies on the AI spectrum as well. Meanwhile the Netherlands and Belgium also have a passion for legal tech innovation. In fact, it’s worth noting that RAVN has just opened an office in Amsterdam. So, everything to play for in terms of non-Anglophone/Civil Law growth in legal AI. Smart Contracts – There’s more to life than AI and smart contracts are potentially going to play a big part in the more automated and autonomous parts of the future legal world. The idea of smart contracts has been tied to blockchain technology, but that is a bit of a red herring. While Barclays and others, along with law firms such as Norton Rose, have been exploring on-chain smart contracts, perhaps the most interesting work is actually off-chain. In this area, two start-up companies that deserve special mention are Clause.io and Legalese.com. Clause is developing self-executing, dynamic contracts that respond to real world external changes via IoT technology. Meanwhile Singapore-based Legalese is pioneering the development of a ‘computable’ legal language that combines legal terms with the clarity and self-executing ability of computer code. Stephen Wolfram, of Wolfram Alpha fame, has also arrived at this party and is also exploring computable legal language. It will be fascinating to see how this area evolves, in part because it will be closely connected to the development of legal AI systems. Investment and Accelerators – There has been an outpouring of investment into legal AI and ‘new wave’ legal tech from a variety of sources. There has also been a growing interest in creating incubators and accelerators to help foster new legal AI and other advanced legal tech companies. A special mention has to go to Dentons’ tech innovation platform, Nextlaw Labs, which has blazed a trail in terms of identifying cutting edge legal tech companies and supporting them. This support is a mix of financial investment, tutoring from tech experts, the ability to pilot their software inside Dentons and generally to be part of a legal tech ecosystem that is dedicated to fostering new talent while also being very pragmatic and focused on solving real world ‘pain points’. Another special mention goes to Seedcamp, a London-based early stage investor that has backed several advanced legal tech companies, and on occasion alongside Nextlaw Labs. A couple of their recent investments include, Clause.io, mentioned above, as well as Libryo, which helps people to understand their legal obligations. There has also been investments from angel investors, including from the perhaps quite aptly named, Tony Angel, the former boss of Linklaters. And we have seen other investors come into the market, from Winton Capital, which has an accelerator programme, to Invoke Capital, the fund owned by Mike Lynch and which owns a big chunk of Luminance. In Australia we have seen a legal tech accelerator set up by the law firm Mills Oakley and in the US, legal publishing giant and now significant legal tech vendor, LexisNexis has launched its own accelerator in Menlo Park, California. #A2J – Legal AI for Good – While all this new legal tech is doing something useful, there is also a new wave of hackathons and ‘law for good’ innovators who are using new streams of technology to help increase access to justice. There are several such initiatives at work, but perhaps one of the most important ones is LawBot, which was started at Cambridge University by a group of undergraduates. Its aim is to provide useful information to victims of crime. It is not yet operating on the AI spectrum, but could quite rapidly evolve in that way. The sky is the limit with this type of application. #A2J will never be the same again. And, in the same field, a special mention also has to go to Stanford University student, Joshua Browder, who stole the headlines earlier this year with his DoNotPay chat bot app to reverse parking fines for people. Legal AI and Automation Events – There has also been a surge of interest in, and in the quality, of events about legal AI. Because of all the changes above we now have the opportunity to hear about real use cases and from a raft of great new legal tech start-ups. Some of the best events in 2016, at least in the UK, included: ILTA’s Insight event in London, which had a great session on practical applications of AI technology (see picture above of a panel on real use cases of AI and automation inside law firms that featured Freshfields and Linklaters, as well as RAVN and Wavelength.Law); Legal Geek’s annual event, which provided a great forum to meet and catch up with everyone in the industry; and an event organised by Cosmonauts at Workshare that had several new legal tech speakers including Zeev Fisher from Pekama. There are certainly even more interesting events next year and Artificial Lawyer will be involved in some of them. And so much more is happening…we’ve got to also mention the important developmental work being carried out by great legal tech pioneers such as Autto.io, which is developing ground-breaking process automation systems; as well as VizLegal, which is reinventing the world of legal research. And there are probably a dozen more companies out there worth mentioning….but space is limiting. One can see that there is just so much that is happening in the legal AI and advanced legal tech world. In fact, many of the new companies are not focused on AI, but on other forms of automation, such as bot-driven contract negotiation, which Synergist is pioneering. Or, like WeClaim in France, which is also starting to pioneer the idea of semi-automated litigation. Then there are those start-ups such as Intraspexion that are using machine learning to help predict and prevent future litigation from happening. While legal expert system company Neota Logic goes from strength to strength in helping law firms to create interactive platforms that clients can interrogate to find answers to legal issues, or use to complete legal forms. There is simply too much to cover in this review. And while 2016 will be remembered by the history books (AKA Wikipedia) as the year legal AI went from theory to wide-scale real world use, who knows what 2017 will bring? Whatever does develop Artificial Lawyer will be here for you, whether you just want to dip in and find out the latest news, or to contribute to this growing community of readers and writers, who include: lawyers, Bar organisations, legal technologists, academics, legal tech companies, entrepreneurs and investors. And finally, Artificial Lawyer would like to say a very BIG THANK YOU! To all the people who read this site, to all the people who have contributed their time and writing for guest posts and to all those who have reached out to share ideas or just to say hello and give feedback. Thank you, without you none of this would be possible. Artificial Lawyer wishes you a very Merry Christmas and a Happy New Year! P.S. over the Christmas period I will be re-publishing some of the best interviews with legal tech founders to help act as a reminder of what has happened so far and keep everyone with something legal AI in flavour to read over the holidays. Also, while you’re recovering from your festivities and are pondering what to do in 2017, please have a think about anything you’d like to share with Artificial Lawyer, whether that’s a guest post or a piece of news. I look forward to hearing from you.